While smaller in size then the bulkier Bull Terrier, the Miniature Bull Terrier is full of life and good-humored. Although it may be smaller in stature, it is not a dog that will sit on the lap as a lap dog. The Miniature Bull Terrier is very tough and because it is smaller then the larger version, it has a tendency to want to prove its strength. It has a healthy sense of humor and is also loyal without being submissive. The Miniature Bull Terrier has a self-sufficient nature so training it requires a rigid but tender method to be effective. It needs a decent amount of physical activity and is very playful in the yard, and especially loves to dig. To stay healthy, the Miniature Bull Terrier needs some, but not a significant amount, of regular exercise each day. These needs can be met with a reasonable walk or a play session in a secure or fenced area. The Miniature Bull Terrier lives and thrives best in an indoor environment, however it does prefer to have some access to the outdoors for play. This breed is successful in an apartment or a city environment as well. The coat of the Miniature Bull Terrier requires only minimal maintenance. The major health concern for the Miniature Bull Terrier is deafness, which usually affects the whites. Some of minor concerns for this breed affect the eyes and are known as glaucoma and lens luxation. On occasion, kidney disease is found in the Miniature Bull Terrier as well. It is suggested that the hearing, especially in the whites, and the eyes be tested to ensure that it is healthy. The average life span of the Miniature Bull Terrier is 11 to 14 years. The larger Bull Terrier is directly responsible for the creation of the Miniature Bull Terrier breed. In fact, they share a similar early history as well. When the Bull Terrier first came around, there was a wide range of weights in these dogs. This range of sizes came from Bull Dogs, White English Terries, and Black and Tan Terriers, which are all ancestors of the Bull Terrier. The Miniature Bull Terrier, with some of them weighing in at only four pounds in the early days, have always been an element of the breed. These Miniature Bull Terriers were previously known as Coverwood Terriers, which was the name of the kennel that created them. The very small variety, commonly referred to as toys, were not desired and after some time the miniatures became the sought after selection. The English Kennel Club recognized the Miniature Bull Terrier as its own breed in 1939. 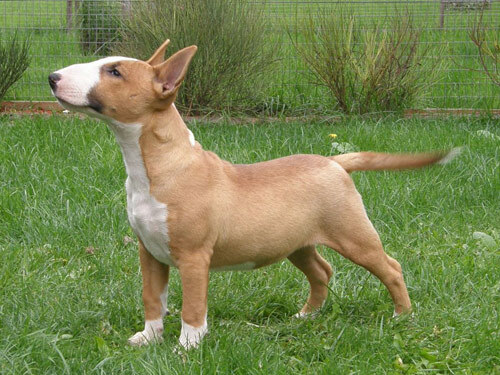 This became an issue because they could no longer be bred with regular Bull Terriers and therefore the Miniature Bull Terriers had to be interbred. To this day, the breed still remains modestly popular and became recognized by the AKC in 1991. While it is still unpopular in America, some believe that the popularity of the Miniature Bull Terrier may increase over time.